The S here stands for spotting and may account for all the white patches on other base colours that we see in cattle breeds - white spotting on Shorthorns, Pinzgauer colour, the piebald pattern in Herefords, Guernseys, Simmentals and Holstein Friesians. 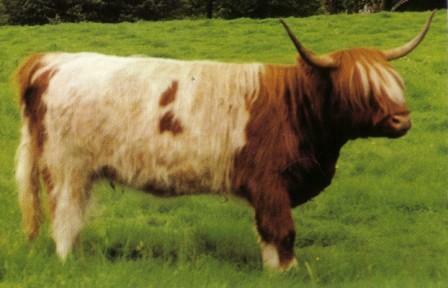 It is reasonable to consider that the parti colour gene in Highlands is found at this locus. The piebald allele (sP) is recessive which would be consistent with the very infrequent appearance of parti colour animals and it's history in Highlands is discussed elsewhere. 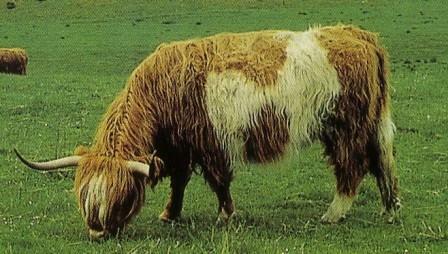 I also postulate that there appears to be a gene controlling the appearance of white on the underbelly or udder in Highland cattle. We see it in our fold and other folds that we visit and can be seen in a third to a half of all Highlands. At the moment I am not sure of a mode of inheritance but it may equally be an alteration in pigment migration and indeed not genetic at all.